Peter Lougheed Provincial Park is one of the best places in the Canadian Rockies to view moose. Although the national parks get most of the attention from visitors to the Canadian Rockies, locals will tell you that Kananaskis Country is prime territory for wildlife viewing. 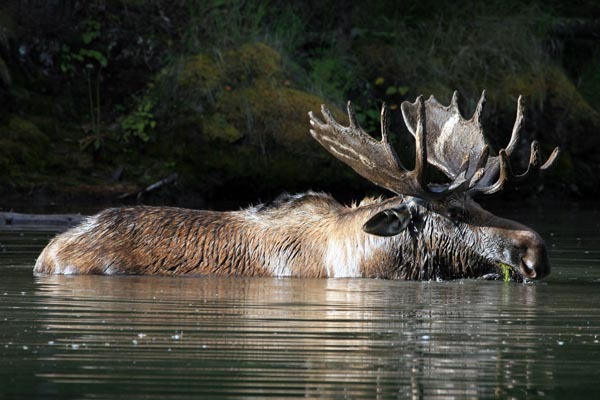 The hills, valleys, and forests are home to an abundance of wildlife, including large populations of moose, mule deer, white-tailed deer, elk, black bear, bighorn sheep, and mountain goat. Also present, but less likely to be seen, are wolves, grizzly bears, and cougars. In fact, Kananaskis is one of the best places in the region for viewing moose. Look for them along roadways in Peter Lougheed Provincial Park and Spray Valley Provincial Park. These two parks also offer your best chances of seeing bears. Elk are often seen along the Kananaskis Valley between the TransCanada Highway and Kananaskis Village. A large swathe of the Sheep River Valley is set aside as Sheep River Provincial Park, protecting the winter range of hundreds of bighorn sheep. Even if you’re not interested in photography, the Canadian Rockies Wildlife Photography eBook, by renowned wildlife photographer Wayne Lynch, is a great resource for searching out local wildlife. It includes all the very best places to view wildlife in Kananaskis Country.